Shop their Sale and Clearance Section. These sections have great deals for every product category. You can save up to 20-70 percent off on variety of quality items on these sections. Check for their ClickTock Sale from time to time because this will only take for a few hours and offers up to 50% off. 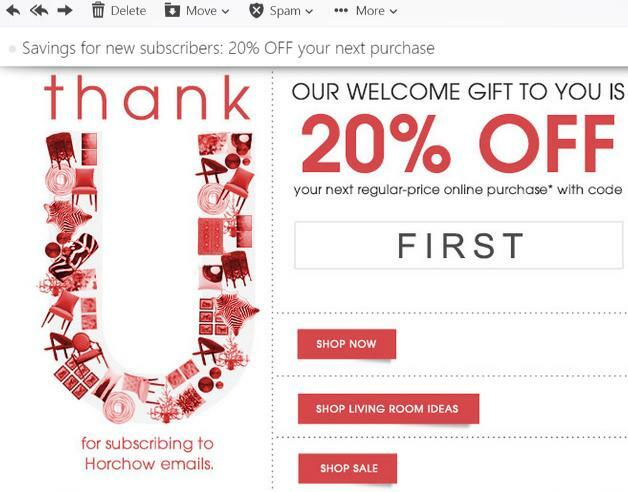 Sign up for the Horchow newsletter to get an instant code redeemable for for 20% off your next purchase. From the coupons listed on top of this webpage or in the Horchow's homepage, click the "Save 20%" banner in the lower right corner to get started. This offer generally applies to a single online order and expires 30 days from receipt of your email. Take note that MacKenzie-Childs, Michael Aram, Juliska, Tumi and Jay Strongwater merchandise is excluded and additional exclusions may apply. The discount applies to the merchandise total only. Enter the code that you received via email in the promotion code box in your shopping cart so that the discount will be reflected during checkout. This does not apply to previous purchases, Horchow Finale store purchases, or the purchase of a gift card, and can cannot be combined with any other discount offer. 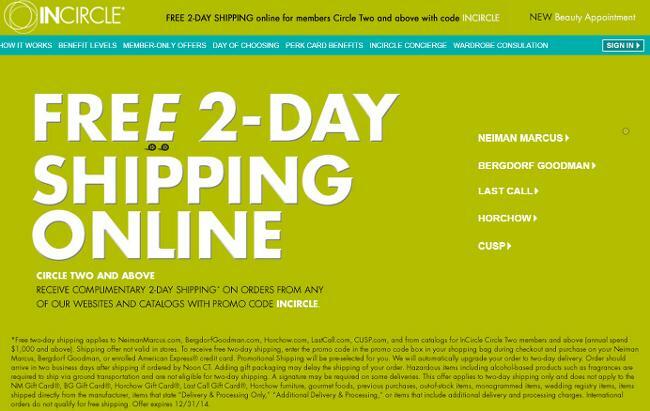 Sign up to become an InCircle member and enjoy a two-day shipping on every purchase order. You can also receive a $100 Reward Card for every 10,000 points that you are going to accumulate. Earn these points from your purchases at Horshow, Neiman Marcus, Bergdorf Goodman, CUSP, and Last Call. Avail of their free shipping for anything in the Boutique section. 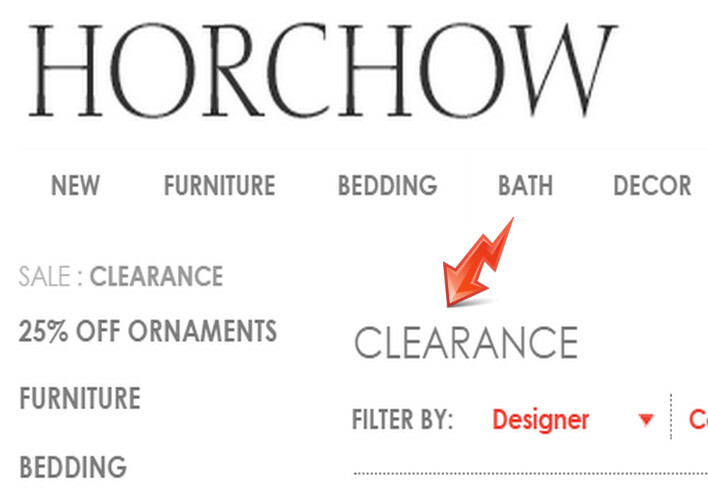 You don’t need to apply any Horchow promo code since they don’t require it in this particular section. Sign up for the Neiman Marcus credit card to get free points with every Horchow purchase. You can also earn points at Last Call, Neiman Marcus, and others. These points can be redeemed for gift cards. Simply visit their credit card page to learn more. Check whether Horchow lowers the price of a particular product within 30 days of your purchase of that same product because they are willing to reimburse the difference, therefore this is savings in your wallet too. They have a Special Program where all design professionals, including residential and commercial interior designers and developers, are eligible for an additional 20% discount on any order. Visit the Horchow website for more details. You can find this on the bottom page of their website under the word Blog and is entitled To The Trade. 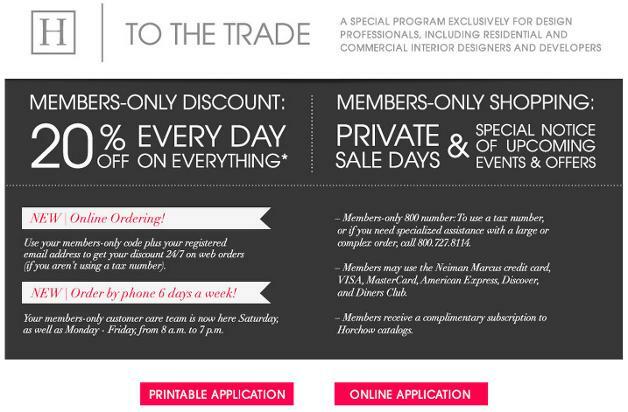 All you have to do is to apply for their Trade Program through their online or printable application. 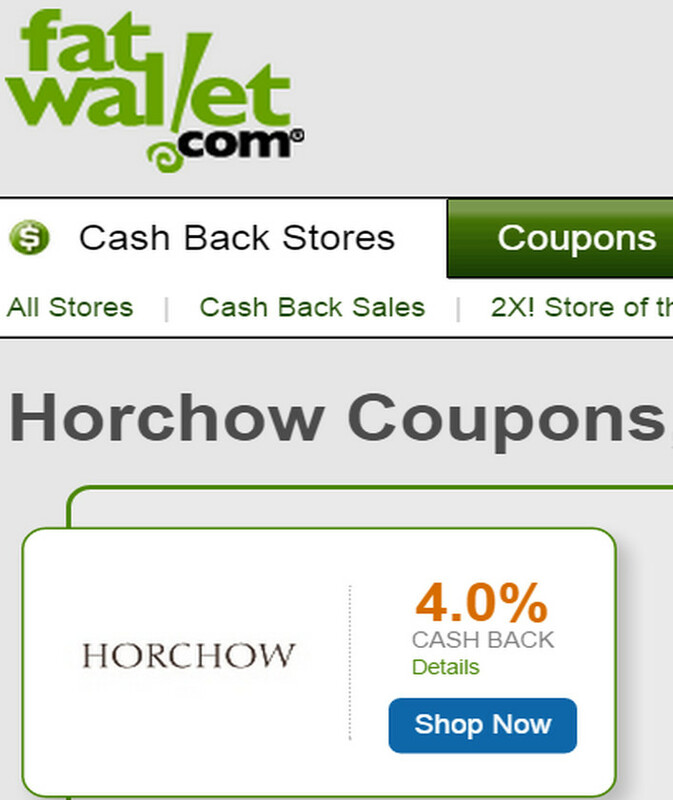 You can also avail of additional savings like Fatwallet’s Cashback before buying anything from Horchow. This website also has a list of updated coupons that you can use when you're checking items out and save money through their cash back reward. This company is named after its founder, Roger Horchow, a business man, author, and a Tony-award winning producer of famous Broadway musicals. They are part of the Neiman Marcus family that is why Horchow sells luxurious home goods, high-quality furniture for the office, bedroom, dining room including bed and bath ware, room decor, lighting, tableware, home fashions, and so much more. 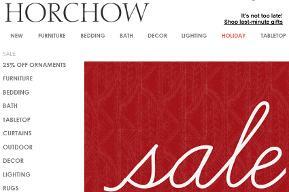 We have the latest coupons for your Horchow purchase today so avail of these discounts now. Please take note that we are an affiliate of Google and Savings.com where Horshow is a part of as a Merchant so therefore try to do your own research when you want to purchase any of their products or services when you are being directed to their official website coming from this web page.